Figure A3. Aleutian anomaly, interpreted as the Aleutian slab, with (horizontal) [vertical] cross sections through (A)[D] the UUP07 p-wave) and (B)[D] the combined SL2013 and S40RTS s-wave models at 370 km; C) the location of the modern geological record that we interpret to have formed during the subduction of the slab. 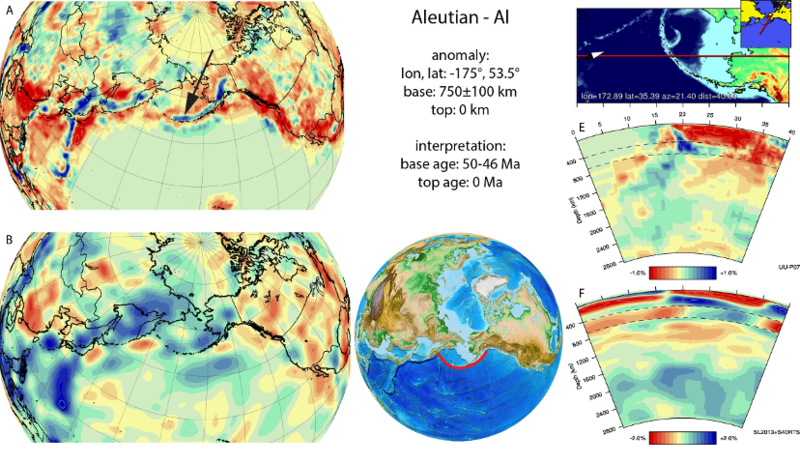 The Aleutian anomaly (Figure A3) is located in the upper mantle below the southern Bering Sea and Alaska and connects to the surface in the Aleutian subduction zone. It was previously identified in the upper mantle (Gorbatov et al., 2000; Qi et al., 2007; Koulakov et al., 2011; Martin-Short et al., 2016). In the UU-P07 model the Aleutian slab is continuous and penetrates the top of the lower mantle below the southern Bering Sea. Van der Meer et al. (2010) initially assumed an inferred onset of magmatism in the Kluane arc at the southern margin of Alaska in the late Cretaceous to Eocene (Nokleberg et al., 2000), as a base age of the slab. We now correlate the Kluane Arc to a more easterly, deeper slab (Yukon slab). Instead, we use the onset of subduction at the Aleutian trench as age for the base of the slab. In the tectonic reconstruction of Shapiro and Solov’ev (2009), 56-54 Ma was inferred as onset of subduction below the Aleutians, based on a change in plate motion of the Pacific plate (Creager and Scholl, 1973; Scholl et al., 1989; Geist et al., 1994). 40Ar/39Ar datings of volcanic and plutonic rocks from several islands along the Aleutian arc shows that volcanism was underway by 46 Ma (Jicha et al., 2006, Chekhovich et al. (2014), providing a minimum age for the onset of subduction. Chekhovich et al. (2014) estimated the time of origination of the Aleutian subduction zone is estimated at to be 47 ± (2–3) Ma. We therefore adopt a 50-46 Ma age range for the onset of subduction of the Aleutian slab.